Bangkok is a city of mega-malls; in fact there’s one opening up almost each year – promising to bring the latest in retail-tainment to the masses. Most of these malls may feature some local talent; but they’re primarily made up of big-name chain stores, both local and international. But there’s another side to shopping in Bangkok; the traditional way at one of the city’s markets – on the street, comparing stall to stall and trying out your bargaining skills. From clothes from young designers, to antiques, to homewares; Bangkok’s on-street shopping is fun and fruitful. Yes, many of these markets and market areas may have become touristy, but they’e still exhilarating and you never know, you might pick up the deal of the century. 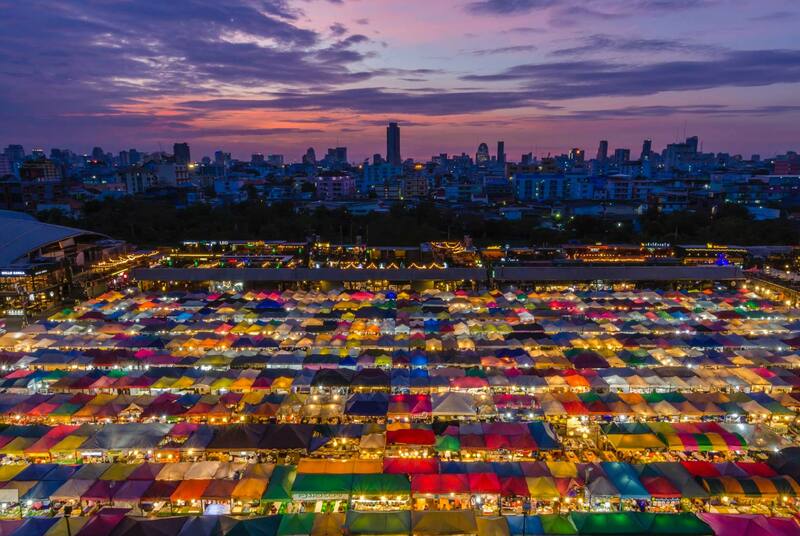 One of the world’s largest weekend markets covers area of 70 rai (27 Acres) altogether divided into 27 Sections, Chatuchak Market contains more than 15,000 booths selling goods from every part of Thailand. Chatuchak Weekend Market, is a very popular shopping center to Thais and has become a popular place for tourists and foreigners alike, boasting with over 200,000 visitors each Saturday and Sunday. This is the biggest wholesale and retail fresh flower market in Bangkok. Part of the Old City, Bangkok Flower market is located on Chak Phet Road near Saphan Phut or the Memorial Bridge. Renowned as the oldest China Town in the whole world. Bangkok’s Chinatown is a popular tourist attraction and a food haven for new generation gourmands. Packed with market stalls, street-side restaurants and a dense concentration of gold shops, Chinatown is an experience not to miss. An entertainment district in Bangkok, catering mainly, though not exclusively, to foreign tourists and expatriates. Patpong is also internationally known as a red light district and a busy night market aimed at tourists. It’s also near the gaybourhood of Silom, that has it’s own market lining the main street each evening – with some stalls that cater to a LGBT+ clientele. Go see for yourself! The original Rod Fai, set in an old train depot has sadly given way to gentrification and redevelopment, but fans of this old antique market and entertainment option fear not. The original founders have opened 2 new locations, one close to the city centre near the Thailand Cultural Center MRT. But for those who want to experience the much larger (and less touristy) version for a slice of real Thai weekending, head out of town on a taxi for around 30-45 minutes.